Annyce Campbell of Mound Bayou, whose portrait graces the cover of "Delta Jewels: In Search of My Grandmother's Wisdom," recently enjoyed a visit to the White House. When University of Mississippi journalism professor Alysia Burton Steele embarked on a journey to record oral histories from African American church women in the Mississippi Delta over three years ago, she was not sure exactly where the journey would take her. It started at as labor of love to reconnect with her recently deceased grandmother, which led to the publishing of her critically acclaimed book “Delta Jewels: In Search of My Grandmother’s Wisdom.” The book led to an oral history partnership with the Mississippi Delta National Heritage Area and The Delta Center for Culture and Learning, a partnership that culminated in an opportunity for Annyce Campbell, featured on the book cover, to visit the White House in Washington, D.C. 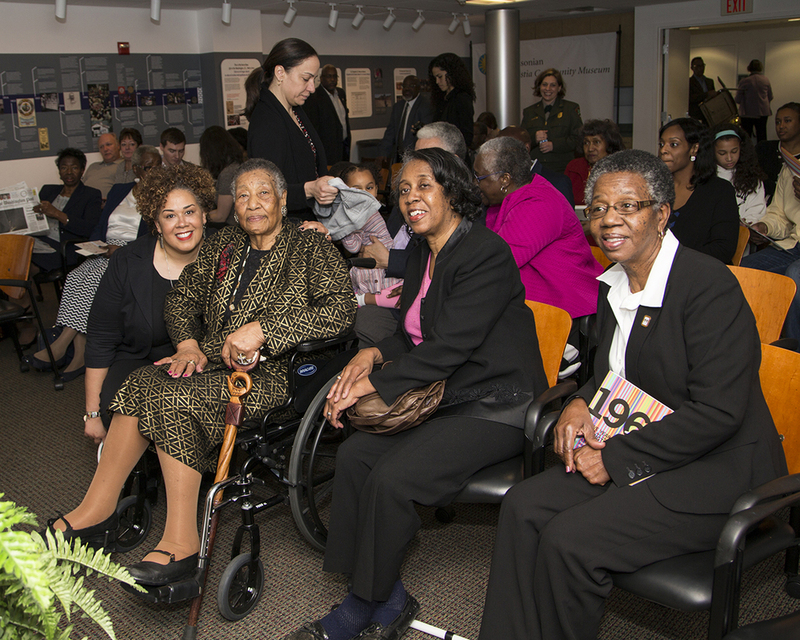 The visit occurred March 12 during a trip to the nation’s capital for a presentation at the Smithsonian Anacostia Community Museum. The Smithsonian program was held in honor of Women’s History Month and the National Park Service Centennial, which is about reconnecting people with their national parks, especially those from underrepresented communities. The White House is part of President’s Park, a National Park Service site. Annyce Campbell, seated, poses in the White House with her daughters Alma Campbell and Emily Harris, as well as Dr. Rolando Herts, director of the Delta Center for Culture and Learning. Campbell still lives in the Mound Bayou, Mississippi home where she and her husband of 69 years raised their nine children. The election of the first African American President of the United States was something she never imagined would happen in her lifetime. Her goal was to enable her family to have opportunities she never enjoyed. She was thrilled that she and her daughters would get a chance to experience the visit together. The trip to the White House was not part of the original itinerary. It wasn’t until Campbell landed in D.C. that the tour was finalized. Mossi Tull, board member for the Smithsonian Anacostia Community Museum, sponsored Campbell’s travel to Washington. Through the efforts of Maggie Tyler, Southeast Region National Heritage Areas program manager, Campbell was able to participate in the tour with her daughters Emily Harris and Alma Campbell, as well as Dr. Rolando Herts, director of The Delta Center for Culture and Learning at Delta State. The Delta Center serves as the managing entity of the MDNHA. The mission of The Delta Center is to promote greater understanding of the Mississippi Delta’s history and culture through education, partnerships, and community engagement. According to Herts, serendipitous moments like this are precisely why their efforts are so important. Steele spent the early years of her career as a photojournalist and editor. She never viewed herself as an oral historian, but through the Delta Jewels project has discovered the craft to be her new passion. Working with the MDNHA and The Delta Center, Steele has been empowered to share the importance of telling stories that have often been left untold and to demonstrate the positive effect conversations can have on communities. “It’s pretty simple, really, why this important. We’re not going to learn and grow if we don’t talk to each other,” said Steele. Alysia Burton Steele, center, with Delta Jewels church mothers at a Delta Jewels Community Gathering in Yazoo City. Mississippi Valley State University will host the inaugural Delta Jewels Oral History Partnership program on Oct. 29 as part of the university’s Zelma T. Howard Lecture Series. The Mississippi Delta National Heritage Area recently forged the “Delta Jewels Oral History Partnership” with Alysia Burton Steele, Pulitzer Prize-winning journalism professor at the University of Mississippi. Steele is the author of “Delta Jewels: In Search of My Grandmother’s Wisdom,” a book of oral histories and portraits of over 50 African American church mothers from the Mississippi Delta, including civil rights icon Myrlie Evers-Williams. The book has received national media coverage, including The New York Times, NBC, National Public Radio, USA Today, Chicago Sun-Times, Southern Living, Essence and The Atlanta Journal-Constitution. The partnership will provide opportunities for MDNHA and The Delta Center for Culture and Learning at Delta State University to present oral history programs and workshops with regional, statewide and national organizations. The partnership is designed to make oral history education and awareness accessible to diverse communities, as well as to promote Mississippi Delta culture and history on a broader scale. Mississippi Valley State University in Itta Bena, Miss. will be the first organization to host an oral history program under this new partnership. MVSU’s oral history program is part of the Zelma T. Howard Lecture Series sponsored by the university’s Department of English. The presentation will take place at the William W. Sutton Administration Building, Auditorium 103, on Oct. 29 at 10 a.m. The event is free and open to the public. The MDNHA and The Delta Center partnered with Steele earlier this year to host a series of Delta Jewels community gatherings aimed at promoting cultural heritage and oral history awareness. The events took place in several Delta communities including Clarksdale, Charleston, Indianola, Yazoo City, Ruleville and Mound Bayou. The Mound Bayou gathering was hosted in conjunction with the city’s 128th anniversary celebration in July. The gatherings attracted over 500 guests from throughout the Mississippi Delta region and the nation. Steele and the Delta Jewels also presented sessions at Delta State University’s Winning the Race conference. Continued demand for these presentations led to the creation of the Delta Jewels Oral History Partnership. To learn more about hosting a Delta Jewels oral history program or workshop, contact Herts at rherts@deltastate.edu, or call The Delta Center at 662-846-4311. The MDNHA is a partnership between the people of the Mississippi Delta and the National Park Service. The area was designated by U.S. Congress in 2009 and is governed by a board of directors representing agencies and organizations defined in the congressional legislation. More information about the MDNHA, including the complete approved management plan, is available at www.msdeltaheritage.com. Here is a great New York Times article about Alysia Burton Steele and her Delta Jewels book. The Delta Center and the Mississippi Delta National Heritage Area are proud to be working with this talented author and photographer. Delta Jewels is a compelling book about Mississippi Delta church mothers.